I'd heard quite a few 'meh' reviews about "Dragon Age II" before I had a chance to play. Not that it was bad, just that it wasn't an exciting follow-up to the stand-out "Dragon Age: Origins"; that it did not equal, let alone surpass, its predecessor. This is true only in some respects. Character-wise, it was brilliant. Varric is the absolute stand-out, the best company any warrior could have - as well as an excellent person to carry the tale into the future. Aveline enjoyably upright in an occasionally teeth-grinding way. Fenris, slightly psychotic, but tremendously honourable (and glowy!) [Though with a disconcerting number of things in common with Faille from "Stained Glass Monsters".] Anders, returning with a warped sense of Justice. And Flemeth, rather marvellous this time round. Environment-wise, fairly poor. There's not much travel, and a big re-use of maps. The combat didn't require a great deal of thinking (but sometimes I like it that way). Plot-wise, this is an unheroic story with a time-skipping structure which gave an episodic and somewhat sour flavour to what is a historic chronicle of how politics and madness in one city led to the great mage-templar war. When your character isn't straight-out hunting money for the sake of money, or losing important people with no chance of rescue, they're wobbling a tight-rope path toward an inevitable confrontation. In the end I felt like I'd surely slaughtered everyone on BOTH sides, and that there could hardly be anyone left to argue any more. I'm glad I played, and in some ways this surpassed "Origins" for me, but it's hard to feel uplifted. So, recommended, but I hope that the next game in the series favours heroism over politics. My favourite writer. Her star may have gone, but her books will shine forever. Just received the final art for Caszandra (Part 3 of Touchstone) and couldn't resist immediately playing with title placement (still have to do font selection and fool with colours, but the overall placement works for me). I'm just awed by the beauty and realism of Simon Dominic's work, turning the planet in Touchstone into a tangible place, and making Cass into someone who I feel you could see walking down the street. And blocking the way, sucking all the attention, the most unnatural, powerful wrongness of the Cruzatch. I love particularly the echo set up by the position of their fingers. "Medair" made the short list for the 2010 Aurealis Awards. I'll just be over here being astonished and speechless...and celebrating by playing "Dragon Age II". Overall an engaging film (certainly much better than the previous alien invasion movie I watched, "Skyline"). But not a rewatch film by any means. The action and pace is what makes this story: you never spend too long in any one place. As many reviews have said, this is a war movie, with aliens. By removing a few scenes, and cutting in different opponents, it would be very easy to make it an invasion of the US by almost anyone or anything. The point of the movie isn't aliens. There's really only one character, a marine Staff Sergeant on the cusp of retirement, haunted by the loss of some of his men during his last combat. In the crisis of a sudden invasion, all hands are 'on deck' and the Staff Sergeant must keep alive a squad who doesn't trust him at all, proving to them - or himself - that he keeps to the marine motto of leaving no man behind. That primary plotline didn't work for me. The distrust of the marines (and the coincidence of the presence of one soldier in particular) seems completely out of place in a story which is so monumental, so world-changing. The focus on "can we trust our (extremely competent and heroic) staff sergeant" sat badly with a 'rout of mankind' story. Unfortunately the rout of mankind story was pushed to the background by the marine trust issues, and while it followed a not unsatisfying course, it did leave me wondering what real marines would think of these movie marines. The ones who walk into a 'hot zone' talking loudly. Who don't seem to have thought about snipers on roofs until after the shots rain down. Would the military send a squad deep into compromised territory to recover a small number of civilians when an entire mega-city is being evacuated and bombs are about to rain down? I found it difficult to believe in these marines (who contrasted badly with another group of SF marines, also led by a this-is-my-first-mission lieutenant). The real focus of the SF story is/should have been the gathering of intel, of quickly and effectively finding enemy weak points. That has been one of the main thrusts of most alien invasion movies because it is a very true one - our greatest weakness in such a situation is our ignorance. And "Battle: Los Angeles" does that as well, but it's not what the story is about. It scarcely looks real: the distance turns the plantations into the landscape of a model train set. The water is brown, black, channeling down the white rows of greenhouses. A house follows along, joining a procession of boats, trees, splintered wood. A gas main sparks and orange flowers bloom and burn in the mud. You know there must be people down there. There was little warning, and not everyone could have evacuated. But the scale hides them, shields them, makes it possible to just marvel at destruction. But then the devouring tide reaches a road, and a car turns around. I've signed up two of my books for the "Read an Ebook Week" event over at Smashwords. Use the RAE50 code to receive a 50% discount on "Champion of the Rose" or "Stained Glass Monsters" during RaEW. 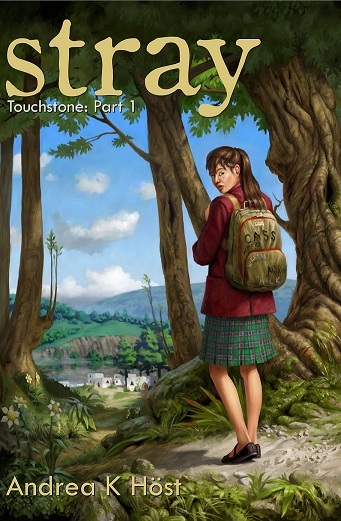 Decided "Touchstone" should be in three volumes (it's over 350,000 words long, which was making for some decidedly large parts).